Gardens Called "One of the Best-Kept Horticultural Secrets in the Area"
The Wellesley College Botanic Gardens were recently featured by the Metrowest Daily News. The paper featured five local gardens, inviting readers to relax and rejuvenate with a visit, and calling Wellesley's gardens "one of the best-kept horticultural secrets in the area." The Alexandra Botanic Garden offers specimen trees and shrubs from around the world. Notable trees include a Kentucky coffee tree (Gymnocladus dioicus), Japanese weeping cherry (Prunus yedoensis 'Shindare yoshino'), tulip tree (Liriodendron tulipifera), dawn redwood (Metasequoia glyptostroboides) and some 300-year-old white oaks (Quercus alba) that pre-date the founding of the College. Pack a lunch and enjoy the brook winding through the space from a waterfall to Paramecium Pond. Wellesley Botanic Gardens are open daily, dawn to dusk. 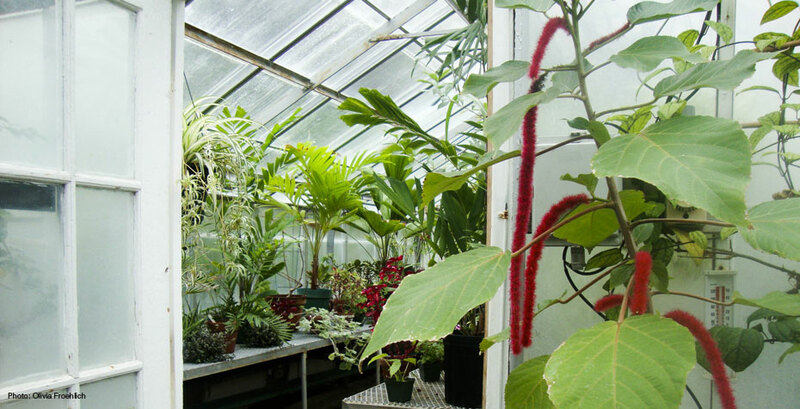 The Margaret C. Ferguson Greenhouses, nearby, are also open to visitors from 8 a.m. to 4 p.m. weekdays, except during the summer. The greenhouses are closed on Saturday and Sunday through the end of August. Read more on the Metrowest Daily News or stop by to see for yourself!